What a difference a couple of days make or doing it a bit differently. Friday I did yet another Conconi running test, since the weather in Denmark currently is very training unfriendly AND I didn't really like the result of the previous one, so either it was bad or I had to reevaluate my status. As can be seen on the splits, this plan gave me much short times at the speed above 12 km/h were I expect my AT, with the final ones on just 0.:45 versus the 2:00 minutes the last time. Clearly running longer at or above AT will increase HR and make it harder to endure further speed increase/time. The most obvious difference was that I reached 15,6 km/h as top speed and my maximum HR was 168. The recovery was just 16 bpm for the first 30 seconds and another 23 bpm in the next with a total of 39 in the first minute (versus the 59 bpm in the previous test!). Once more I did a short cool down interval of at 9 km/h not passing 140 bpm. Two different test within 4 days with quite different results, the conclusion is blahhhhhh - I've improved :-). 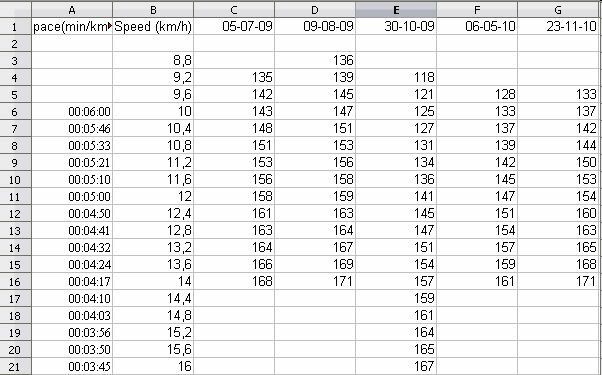 Today I performed yet another Conconi running test, adding up to a total of 5 recorded within the last one and a half year (See my post Performing a Conconi running test, from 9. july 2009 for a little background info). One thing that stands out is the fact that the terminal pace was (only) 14 km/h and that at an HR of 171 bpm, close to my maximum HR. It was my judgement that I could not complete 2 minutes at 14,4 km/h though it somehow didn't feel as hard as 171 bpm normally does, the few time I've hit it in interval training. The recovery for the first 30 seconds after I stopped the test was 30 bpm and thereafter another 29 bpm, with a total of 59 bpm within the first minute. After that i did a 5 min after jog at 9 km/h and look what happened, my HR just increased to the level of what should be app. 11 km/h! and even a walk at 5 km/h didn't send my HR below 100. The test has once more proved not to be usable for the original idea, but as usual that won't prevent me from drawing my own conclusions. As a little background info, I haven't been running much since April when I got an injury in my right Calf in a training pass (LSD) after at successful half-marathon.That surprisingly didn't hinder me in getting a new personal best it this years DHL-stafet with 22:10 for the 5 km, with an to my extremely high HR ending with 176 bpm. The overall behavior is the same in all measurements, no clear tipping point. 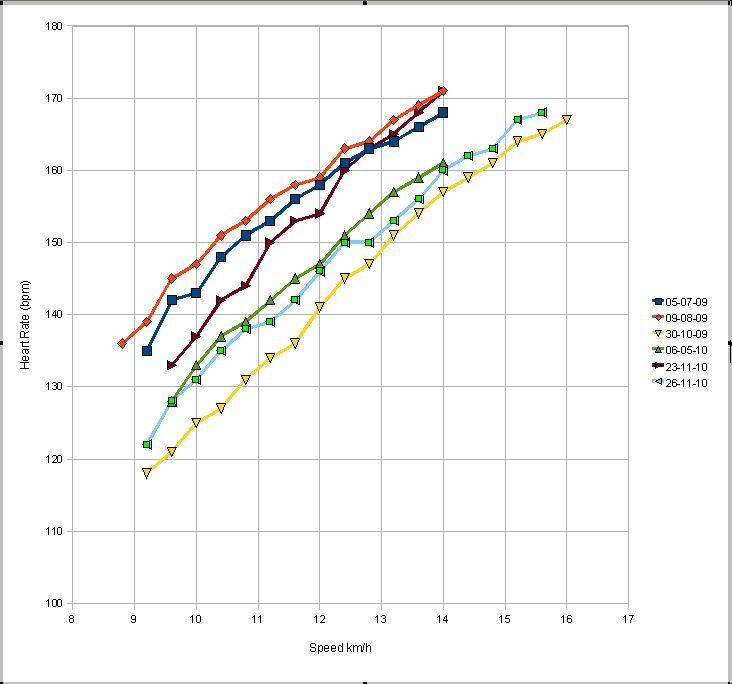 Overall the maximum speed is like the other tests except for the phenomenal one a year ago. The maximum HR is high. 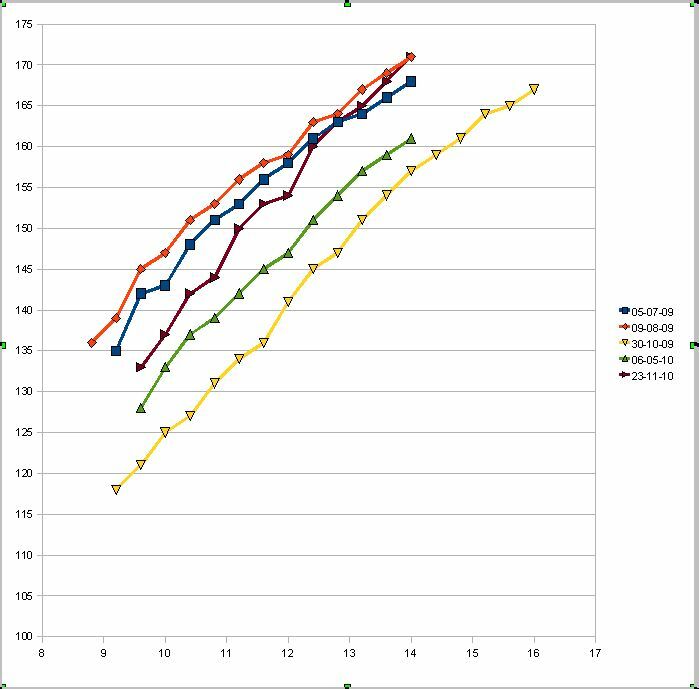 One thing that does seem different is that the slope, where the others seem parallel (same slope shifted left or right), this test shows a steeper slope, as if I've primarily lost ability to keep top speed. what can i really use if for? - not much. Though I surely was in a better running condition last autumn and spring, it does seem as if plenty of other factors influence much, like for an example the10K I did last Sunday (48:25).